It came as a surprise for the whole nation when the UNF-led rainbow coalition announced Maithripala Sirisena as their Common Candidate in November 2014. The campaign was not without challenges. The coalition, united against the sitting government, pledged to fight corruption and other issues that had ailed the nation. The first milestone of their victory came to the fore when the nation elected Maithripala Sirisena as the seventh Executive President of Sri Lanka on January 8, 2015. In an interview with the Daily News, Professor M. O. 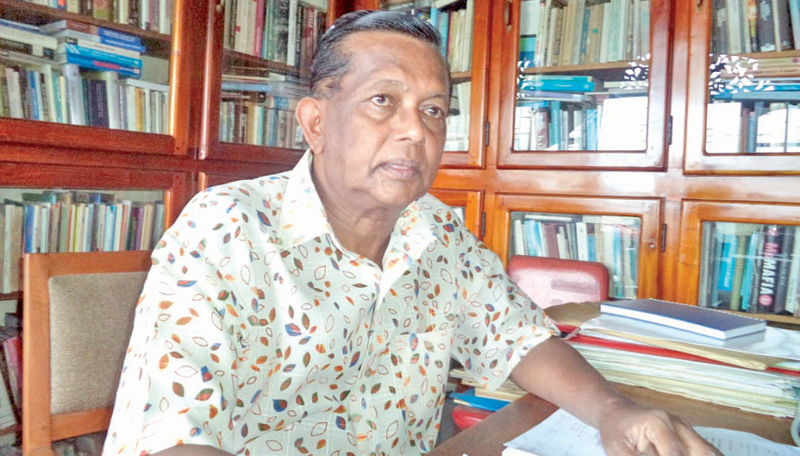 A. de Zoysa, a retired professor in political science attached to the University of Peradeniya, reviews the progress the government has made so far. Q: The coalition government was given its first mandate on January 8, four years ago. It had many promises to deliver on. Do you think they succeeded in keeping the promises? A: The new government was established by a mandate given by the people in 2015 where they toppled the previous corrupt regime which was more of a family rule which ruled by promoting ethnonationalism, fascism and nepotism. I need not go into details but the number of extrajudicial killings which took place, the intimidations exercised on media personnel and civil society activists, the fear spread by white vans and other various fear mongering instances were prime reasons why the people came forward and toppled the government. Besides, the previous regime’s economic policies and the investments made on profitless enterprises raised the debt burden of the country to unprecedented levels. Therefore, what the government which was elected to office in 2015 inherited was a state which was battered on all fronts. So, the immediate task of the Yahapalana government was to remove the undemocratic practices of the previous regime and promote democratic culture and bring about freedom of speech and ensure that all citizens’ rights are protected. The government managed to repeal the draconian 18th amendment to the constitution and bring forth the 19th amendment which reduced the powers of the executive drastically and re-injected life to the independent commissions which had gone defunct. The media institutions and media personnel were granted the freedom to function independently. Intimidations were rarely heard of over the past three years. Many media institutions criticised the government and its politicians in serious ways and yet intimidations were virtually unheard of. The Judiciary remained impartial to a great extent. The appointments were made on a non-political basis following standard procedures and its independence was quite evident when it gave a landmark judgement revoking the President’s decision to dissolve parliament prior to the expiration of its term. In the economic front, it has managed to maintain the economy without seriously damaging it further. Though foreign direct investments have not taken place within the country as expected, the government through its enterprise Sri Lanka programme tries to produce a number of entrepreneurs. But this too was hindered with a coup taking place. The government mentioned several times that they will initiate the programme again. Despite several grey areas, it can be said that the government has somewhat performed well given the circumstances. Q: The motto of the incumbent government is Good Governance. Has the government been able to live up to that aspiration? A: In the economic context, the government’s achievements have been somewhat slow. But what can one expect with an increasing debt? Still, the relative economic stability and progress could be witnessed. Structural adjustment programmes and programmes promoting austerity economics were quite visible to bring about macroeconomic stability. It would have been interesting to see how Enterprise Sri Lanka would have gone forward, but it got halted prematurely. Hopefully, it will be re-established and it will bring about development at the grass root level. Q: Debt has remained a natural burden to the successive governments of the recent past. What is your comment on the methodology of the Sirisena-government in handling the country’s economy under the debt yoke? A: It is obvious that the economy did not recover as fast as people expected. The economic situation of the country has been deteriorating over a long period of time and due to the massive loans obtained by the previous regime, it is further hindering a fast recovery. Debt servicing became the major concern of the government and it had to take actions to ensure that the debt is paid on time. Other than this, the government did introduce various economic policies to maintain macroeconomic stability but then due to the global economic issues and the rupee continuously depreciating against the dollar, as was the case with many other countries, economic recovery is taking place slowly. Due to the serious political volatility, foreign investments did not take place as expected and the Rajapaksa camp has mobilized people against the government entering beneficial bilateral and multilateral trade agreements. Furthermore, the tax policies adopted by the government too created a certain social upheaval. Despite its promises to reduce the indirect tax on the general public and increase the tax on top income earners, it is questionable whether the government really did so. Anyway, the limited structural adjustment programmes and austerity policies did not go too well with the local socio-political ethos. As a country heavily dependent on welfare policies, austerity and ultra neo-liberal policies can come across as a shock. So the government should take a step-by-step approach and make the necessary structural changes in the economy and the culture surrounding the economy. There should be a balance and with time, these policies will get normalized and eventually be accepted if growth and stability are achieved. Q: Fighting corruption was another key promise brought forward by the government in its campaign. Has the government delivered on that promise? A: Largely yes. Despite one or two hiccups, the government has managed to stay clean without promoting corruption or nepotism. The only serious issue against the government surrounds the Central Bank Bond issue. But then, there is an investigation and court case going on with regard to this and hopefully it will bring the perpetrators to justice. Other than that, there were no serious instances where corruption came to the fore. The previous regime was obviously noted for its corruption and the FCID is still conducting investigations. There are several court cases going on against certain key political figures of the previous regime. So, that seems to be an area where the current government managed to improve upon. Q: This year will witness the tenth anniversary of war victory. National reconciliation became a core subject in the post-war phenomenon. What is the government’s progress on that premise? A: This is again an issue which has to be somewhat looked into seriously. Even though it has been ten years since the end of the conflict, it is questionable whether the current government took enough steps to promote national integration and take necessary steps to promote nation-building. So, it has to take immediate steps in this regard and promote the concept of one nation one country imbibing equal citizens with equal opportunities. A positive move in this direction came when the Tamil National Alliance Leader R. Sambandan was appointed as the Leader of the Opposition till the constitutional coup took place in late November 2018. Further, demilitarization is taking place in the north and some of the lands which were occupied by the army were handed back and is in the process of being handed over to rightful owners. In addition, infrastructure development is taking place continuously. But it must be accepted that this government too could not provide a political solution to the ethnic issue. A glimmer of hope is there as a new constitution is in the process of being formulated. Hopefully, the government will look into the issues faced by the minorities in this country and provide a lasting political solution incorporating their demands. Q: The previous regime earned criticism on its aligned foreign policy. What is your assessment of the incumbent government’s foreign policy? A: At a foreign policy level, the current government is miles ahead of the previous regime which favoured one country over and above the rest. The current government was able to review the GSP scheme back and managed to bring back normalcy to foreign relations. The government managed to repair the damaged relationships with the western countries and built up a steady and strong relationship with India, Sri Lanka’s immediate neighbour. Q: Crime, especially the underworld activities, has been the order of the day. At times, one may wonder if the phenomenon is beyond the government’s control. Your comments? A: Obviously, the government has been successful in arresting drug-related issues. That is one reason as to why so many drug kingpins were arrested and detained. The government must anyway continue to strive forward to curtail this menace destroying generations. When it comes to underworld activities, there is a certain drop and it has stopped being a daily occurrence. But obviously, the current government has not been able to curtail and curb its activities fully. This is an inherent problem with the political system of this country as certain politicians have direct dealings with the underworld and therefore, the underworld gets direct protection from certain influential people in this country. So, in order to curb underworld activities, I guess the whole political culture of this country will have to be overhauled. The government has put certain steps in the right direction to put the political system into a correct path. But it will have to strive hard in order to bring about a novel political culture. Q: The coalition-led government’s road to victory, four years ago, stems from the public anticipation for a change. But the recent turn of events brought the subject of a general election to the fore indicating that the public confidence in the incumbent government must be put to test. Do you think the government still has the public endorsement? A: Yes. The people stood by the government when the constitutional coup took place and it was overthrown. The civil society stood strongly by the government and even the general public condemned the coup. So that is in a way signifies that people still have faith in the government and its actions. Despite several drawbacks, this government has guaranteed the people freedom of choice and promoted democracy. Q: Parliament passed the Right to Information (RTI) Bill with amendments. The Bill guarantees Right of Access to Information. Is it implementable on a practical scale? A: The RTI is an important act. But it has several serious drawbacks. The authorities can at times delay providing information or else even hold back giving information on the grounds that it is sensitive or classified. If the authority does not pay heed to the commission's directives, then the case must be taken to Courts which might cause a lengthy delay and incur a cost for the person seeking information. So this act must be further strengthened and it should be binding on public authorities where they are bound to give information when requested within the law. But despite all this, it must be said that it is a step in the right direction. Q: A new constitution is in the offing. However, the current constitution has survived more than three decades albeit with 19 amendments so far. Why a new constitution altogether all of a sudden? Is it practically possible? A: This is another point of contention. Given the composition of the parliament now and given the volatile political situation within the state, it is questionable whether the government will be able to muster a majority in parliament in order to implement a new constitution. We do hear the politicians state that the current constitution must be replaced and that the government is about to restart the process of formulating this new constitution. But whether it can be implemented and enforced is problematic given the current political climate of the country. But without question, we all have to agree that the country requires a new constitution which will be one promoting national integration and political stability. The constitution should always have a sound political, economic and social philosophy which will promote the overall growth of the state. So let us hope this government can turn this into a reality. But this will be a herculean, uphill, task.